Good to be back at the computer, readying another newsletter for you. The rain we’ve had of late has been long overdue – dying gardens and not enough grass for livestock, but all is well now I suppose, except for those not in the ‘lucky zone’ of receiving this ‘manna’ from above. I’d like to wish god-speed and get-well wishes, on behalf of our group, to a few of our members or close affiliates who are suffering the effects of that dreadful disease of so many forms (cancer.) It seems their number is increasing out of proportion, and these are only the few that I know of personally. So - Coral, Russell, Maree and Joan, please fight this devil with all your might and get well soon. (That’s not to say that we don’t wish the same for those I don’t know of, or people suffering other diseases that can be just as bad, or worse.) To all…we wish you…get well! Heat or motion sensing camera’s are being deployed more and more often now to find out what we have left in our patches of bush, an easy way of ‘seeing’ when we are not there – day or night. The Bingi L’care Group is one such body that is using three of these cameras to try to establish what is in the local area. They were purchased thanks to a grant from Landcare’s 25th Anniversary Fund and are loaned out to anyone who wants to find out what is on their property or local patch. Please ring John McClumpha on 5185 1455 if you’d like to borrow one. So far in a bit over a years’ use, we have not found anything that we would not expect to be there or anything considered rare but we will keep trying. As an example, in the north-west corner of the Alberton West State Forest, about a year after I moved into the area, I found footprints left in the mud of what I suspect were Bandicoots and wondered if the foxes had gotten them all in the meantime. We are still trying to establish the truth of that guess. I found this, below, (what I thought) quirky piece in one of the birding magazines I read and thought it might interest you all. A similar thing could possibly happen to our group as we deploy our sensing cameras in different places around our area – but hopefully not with crocodiles! The Gooniyandi Ranger Group in Western Australia’s Kimberley Region had thought their missing remote camera, set up to film freshwater crocodiles, must have fallen into the water. They were surprised to receive a phone call from a Parks and Wildlife ranger who had retrieved their camera from a White-bellied Sea Eagle – over 100kms away! Footage recovered from the camera revealed a prey’s-eye view of the raptor swooping down and flying off with the camera, together with a few out-of-focus ‘selfies’! (where the word or sentence can be read the same, forwards or back-wards!) Let me know if you have others and I’ll put them in next time. THE ENGLISH LANGUAGE: Poet unknown. on hiccough, thorough, slough and through? No both in bother, nor broth in brother. and go and do, and thwart and card. I hadn’t learnt it at fifty-five! So now, what I want to know, is how do people find the time to discover such esoteric things? They are obviously not farmers…or writing the next edition of the Bingi Babbler! Don’t forget the Lyrebird article (click this link) for a very interesting read and some lovely Lyrebird photographs! 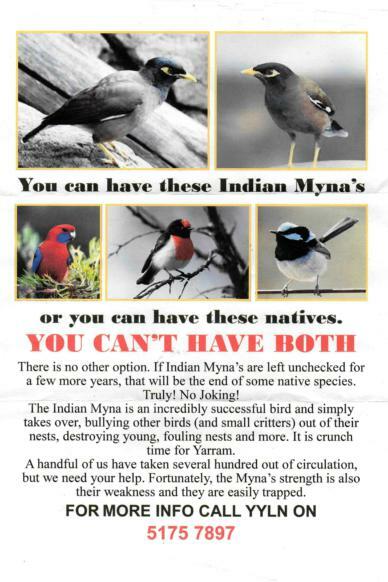 Indian or Common Myna’s are a threatening process happening right now in and around the Yarram area – and probably getting worse as we speak. Are you able to help out? Read on to see…..
Indian Myna’s either destroy or physically take over the nesting sites of many of our native birds and animals and leave our indigenous wildlife with second-rate homes – worse still – often with no homes at all. We need to eradicate, if possible, all of these introduced birds to give our robins, wrens and other small birds a fair go. To that end, myna traps have been designed that target (but don’t specifically only) attract the pests, which means that we have to release the good (accidental catch) birds. We also need to be humane in treating the Myna’s and need to remove and kill them in as timely and kindly way as is possible. The Myna Eradication Program in this area was the brainchild of Trevor Colvin and the Urban Landcare Group. Three of their members have so far eradicated 240 Myna’s in our area. Traps are available from YYLN office at a cost of $35 and I encourage people particularly on the outskirts of Yarram to involve themselves with this program to help stop the outward spread (they usually start off in urban areas where life is easier) of this dastardly bird. Contact for more information - YYLN Office on 5175 7897. Our activities of late have been the Clean-Up Australia Day held in March where six of us walked about 10kms along three different local roads and found a measly five feedbags of rubbish. Hardly worth the effort one might say…but we saw it in the positive light that Bingi is not as dirty as it was the last time we did this a few years back and even cleaner now! We chomped on very fresh roadside apples as we worked then held our mini-meeting, declined the BBQ, and went home early. Four of us also had a rather lovely walk to see if we could find the Gunyah Tree on the Grand Ridge Rd as well as birdwatching up there. Our best bird for the day was probably a female Rose Robin, and we didn’t see the Gunyah Tree – but we’ll go back for another try on that! Sally-Ann Henderson was the speaker at the YYLN Annual BBQ and gave a brilliant slide-show and talk on her experience of her trip to the Antarctic via the tip of Sth America, South Georgia Islands and the Falkland Islands and had all 40 or so of us in attendance, entranced. It was a laid-back, very pleasant day with good weather and fine folk. In 1964, Donald Horne wrote "Australia is a lucky country, run by second-rate people who share its luck." It was a searing criticism that has now been adopted as a nationalistic boast. Luck: it’s a millstone round our neck. We take it for granted, and we don’t ask why. We don’t say we work harder than other countries, or that we’re stronger or smarter or more creative, or even that we’ve been blessed by destiny. We’re just luckier. And that leads nowhere. At the 2014 Communities in Control Conference (The Lucky Country Conference) - Melbourne, May 26 and 27 - we want to bring the spotlight back on what we’ve gained and lost as a society, and how we can organise ourselves to get from where we are to where we need to be. Should community groups, charities and local government authorities be small, nimble, and responsive, or big, cost-effective, and secure? Award-winning journalist; political & international editor, The SMH. Author, lecturer, social commentator, columnist, broadcaster. · Anything is Pozible! Crowd-sourcing funds for your not-for-profit adventure. $260 per person. Click on this link to > REGISTER NOW! These cows come complete with milk processing machines inside them poor dears. 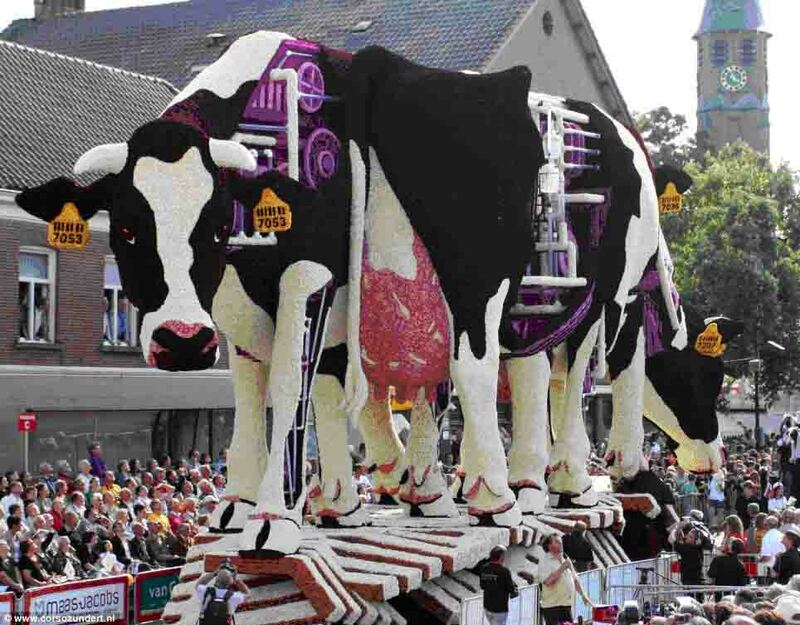 Part of a street parade in Bloemencorso, Holland – all made from Dahlia flowers!! 16. Money can't buy happiness, but it sure makes misery easier to live with. 18. I used to be indecisive. Now I'm not so sure. 20. To be sure of hitting the target, shoot first and then call whatever you hit, the target.